Video-Mediated group communication is quickly moving from the office to the home, where network conditions might fluctuate. If we are to provide a software component that can, in real-time, monitor the Quality of Experience (QoE), we would have to carry out extensive experiments under different varying (but controllable) conditions. Unfortunately, there are no tools available that provide us the required fined-grained level of control. This paper reports on our efforts implementing such a testbed. The testbed provides the experiment conductor full control over the complete media pipeline, and the possibility of modifying in real-time network and media conditions. Additionally, it has facilities to easily develop an experiment with custom layouts, task integration, and assessment of subjective ratings through questionnaires. We have already used the testbed in a number of evaluations, reported in this paper for discussing the benefits and drawbacks of our solution. 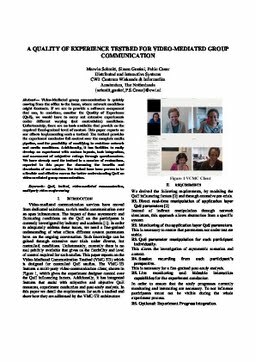 The testbed have been proven to be a flexible and effective canvas for better understanding QoE on video-mediated group communication.